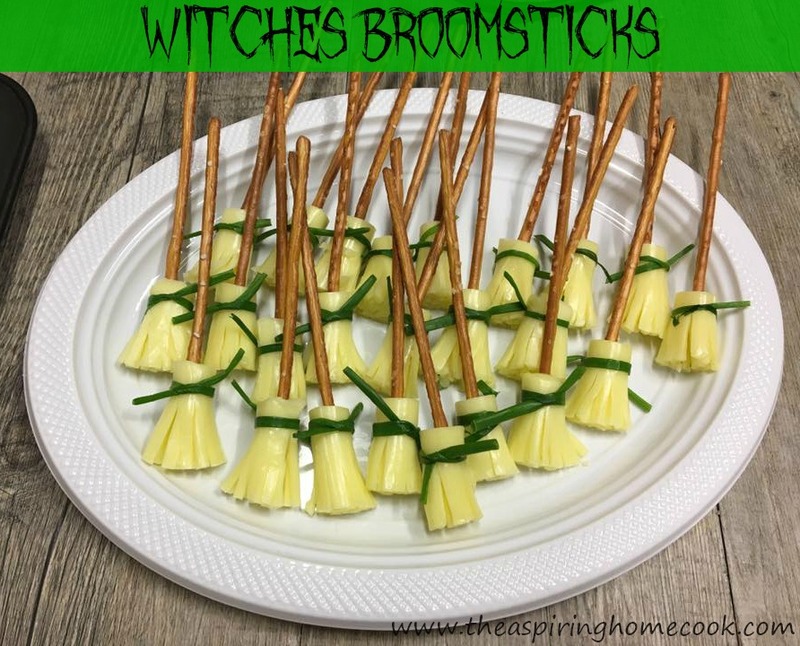 So continuing from my last Halloween post, here's another quick and easy savory treat I put together for the same party. If you haven't yet read that one, go check out the Monster Eye Crackers I posted about here. If you've been around these parts before you know the most important part of food for me is taste. It helps if it is quick and easy to make and bonus points if it is cute and quirky too. This little treat ticks all those boxes. I found this one in quite a few places on the internet and decided that I had to try them out. They are perfect to make for a Halloween themed party. I will admit that the cheese stringers were a little fiddle to begin with, but eventually things started moving along much faster. And, considering there was zero cooking involved, I still give this little snack a thumbs up. 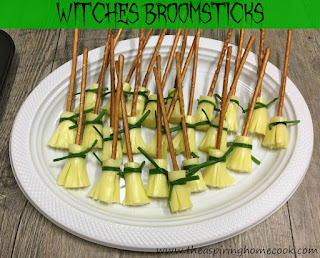 Kids will love the novelty of these 'Witches Broomsticks'. I made these to serve at an office party and the adults couldn't keep their hands of them either. These snacks also use only 3 ingredients - pretzel sticks, cheese stringers and fresh chives. There is not much of a process involved either, so let's get straight to the instructions. I hope you make these savory treats this Halloween and enjoy them as much as we did. Start with the cheese. Cut the cheese stringer sticks into about 1 inch pieces or one thirds. For each of these pieces, cut up or pull apart two thirds of the length of it to make the bristly edge of the broomsticks. Now simply pierce the uncut end with a pretzel stick. Finish them off but tying with a piece of fresh chives. What treats are you planning for this Halloween?? ?